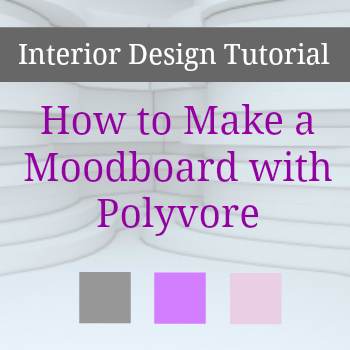 Welcome to the first in a series of posts discussing How to Make a Moodboard. Moodboards are used by interior designers to help create the look of a decorating scheme, to help provide inspiration and to help guide and focus the design. Often they are made using images and cutouts from magazines, put together on a piece of board to illustrate the scheme, although now there are many different online tools for creating moodboards it’s worth taking a look at them. Anyone and everyone should use them. They are really useful when you want to visualise how a room will look once you have revamped or decorated it. It’s the hardest thing, you’ve chosen the cushions or the wallpaper, you like some curtains or a rug but you just don’t know how it will all look with your current furniture. Well an online moodboard is the answer and in this series of posts I’m going to look at different online moodboard creators and talk you through how to use them. Firstly we’re looking at Polyvore.com. Polyvore can be used to create quite complex, detailed moodboards, either starting from scratch or using templates provided on the site. It’s often used more for fashion boards, but works just as well for interior design moodboards too. This one above was created from scratch and was designed to produce a feeling about the time and era, but you can also put them together, like this next one to depict how the finished decor of a room will look. I used this one to help me visualise how my Dining Room could look following the makeover last year and it was really useful. Firstly you need an account, so hop on over to the site and sign up. Polyvore works like many other social media sites where you can gain followers and interact with them and their boards. Personally I’ve just used it for creating moodboards for my own purposes but there’s a lot more to it, if you’re looking for that. Once you have your blank Moodboard it’s time to start being creative. Now you can go to the Templates tab as you’ll see in the right corner of the image above and use a template already created by another user, but I tend to find these are fashion focused and for our purposes a blank template is better. This is a screen shot of the items I’ve previously clipped into Polyvore to use in sets or moodboards I’ve created in the past. Bringing them in here will allow you to drag them over to your blank Moodboard. Go to http://www.polyvore.com/cgi/clipper where the instructions take you nicely through how to add the clipper to your toolbar. 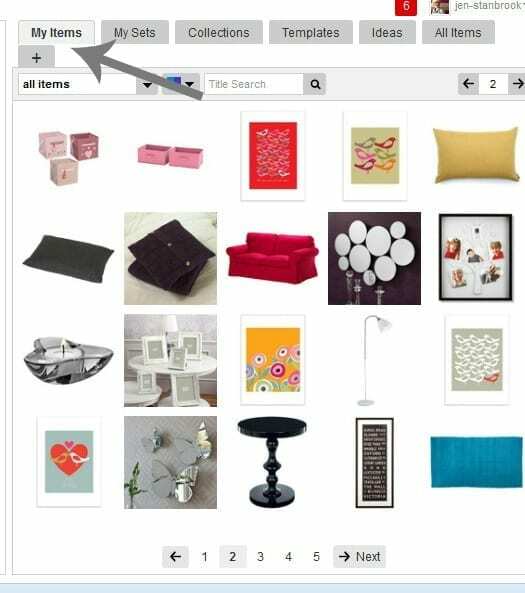 Once you’ve done this it’s simple to grab images and add them to your Polyvore Items. So, for the purposes of our tutorial I’m going to show you how I would create a simple moodboard for a ‘Girl’s Pretty Bedroom’. Firstly I’ve added a new tab and searched for Bunk Beds. From the list of items already within Polyvore I found one I liked and dragged it over to my Set. Next I want to add in a few extra items to create the feel and look of a room I would like and move them around the board to create the set. Some of these items I’ve clipped in, some I’ve searched for and others were in ‘My Items’ already and this is what I’ve created. As you can see it’s quite simple but if these were items you’d seen online that you might like to purchase then you can clip them all into one place to see how they would look together. 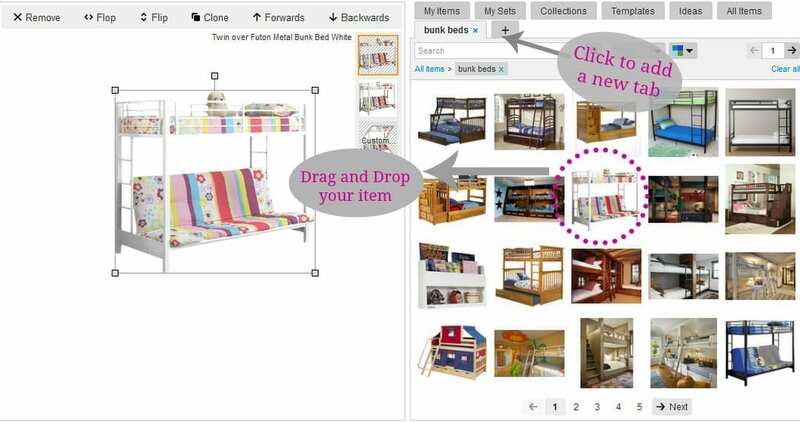 If you want to take it a step further you can use Polyvore to add lots more to your board. From the ‘All Items’ tab you can add all kinds of embellishments to really bring your board to life. Frames, backgrounds, texts and even a colour palette can be included to give your board focus and to help guide you in your decorating. For my board I’ve added some colours, a little text and a frame to complete the look. I then hit Publish. 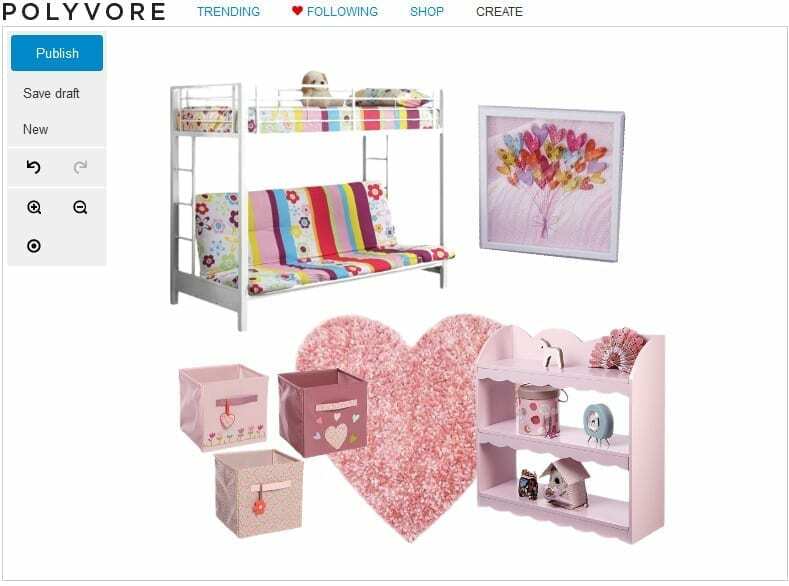 And there you have it – one Polyvore Moodboard designed to help you decorate your daughter’s bedroom. You can add as much or as little as you like to the board, just take a look at the examples and popular boards on Polyvore to give you ideas and inspiration. Once you’ve practised a little and understand how the site works I guarantee you will lose hours to it, so be warned! What do you think about Polyvore? Do you see the value of creating a Moodboard or would you not bother with them? Do you use other sites for Moodboard creation? I’ll be featuring other sites in this series so if you’d like to see a tutorial on a particular site do let me know. I love this idea. I’ve always wondered how people come up with outfit combination collages on their blogs! Now I know. It gets a bit addictive tho you know! Nice when you want to see how a scheme will look once it’s finished. Brilliant, glad it was useful. Let me know how you get on! nice article,well written, appreciated work,very informative and useful.Thanks for sharing. I love Polyvore. I am so excited that they have included “home” items in their shop and editor so you no longer have to search and clip from the web to find items. ( unless that is your thing! ) I also like being able to find inspiration through all the folks I am following! Excellent tutorial, thank you so much! I have learnt a lot today that will really enhance my blog! Great site too, love your style and ideas! This is awesome! Went to my bookmark list has I got around 1/3 way through this blog. My house is boring and you just gave me quite a few great ideas to do and i’m sure my wife will have fun with a small project. She is one of those do it your selfers who LOVES color. I think I have actually found something that will go great with her hello kitty game room HAHA. Thanks again.